I thought I'd showcase one of the blogs I go to the most for entertainment news and fashion opinions I respect: Tom&Lorenzo. 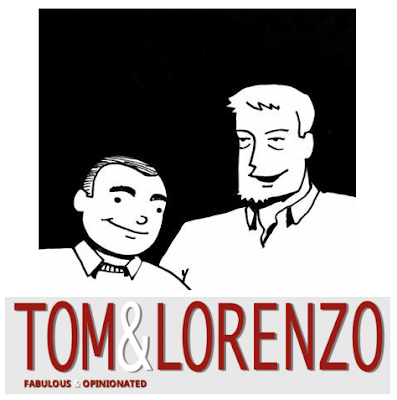 I only recently realized they changed their official blog name from Project Rungay to Tom&Lorenzo. It makes sense though since when the blog first began in 2006 it was primarily about Project Runway, but covers a lot more now. Even if you didn't keep up with the episodes of PR, this blog was the perfect way to keep up with the winners, drama, and hilarity of the show. Overall now they've got fashion "In and Outs," recaps of their favorite shows, and commentary on photo shoots or editorials. I'm a big fan of their Glee , Mad Men, andWalking Dead recaps. It's the first thing I go to after I watch the show wondering if our opinions will match up. 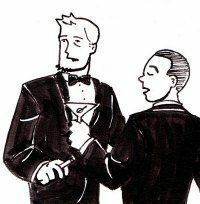 My favorite part has probably been their costume analysis of Mad Men, or "Mad Style." They were amazingly intricate, picking up on small details and what they mean for each character. It's something I haven't seen anywhere else that detailed and it made me even more in awe of Mad Men's costume designer, Janie Bryant...and of course in awe of the work the guys did breaking down and screencapping each costume they could find. I ran into Tom and Lorenzo outside the Project Runways finale show this past year they were just the nicest. They introduced me to Uli from Project Runway and we all gossiped about the drama and who should win this season. I was in blogger heaven! While they get invited to fashion shows and hobnob with Project Runway contestants, the great thing about them is that no matter who they know or or who they meet, they are still relatable fans so reading their commentary is like gossiping with your best friend about all your favorite shows!